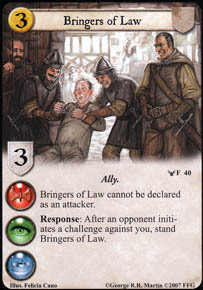 Does this card mean an opponent could never win unnoposed as this card always stands and knees again as a defender (except of course if it is stealthed)? This is a fairly good card. Can definitely help defend in all three challenges and depending on the "luck of the draw" can help win dominance if multiples are out. good support good in a Kingsguard deck? but are those deck even viable?